How Did Bridges of Peace and Hope Get Started? 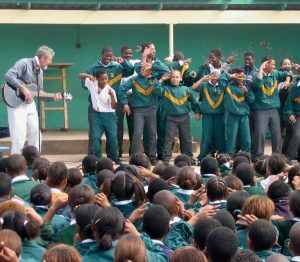 In 2005, songwriter and storyteller John Farrell traveled to South Africa to speak at a teachers conference at Rhodes College. 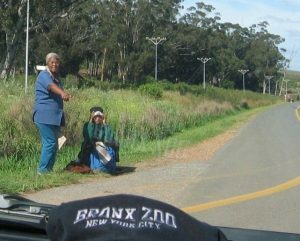 Driving along the Garden Route near Cape Agulhas, John picked up two hitchhikers, a shy 12 year old girl named Amore and her grandmother (GoGo) Andeline. Amore spoke a little English and Gogo spoke none but using a few words, gestures and smiles, the three were able to communicate. 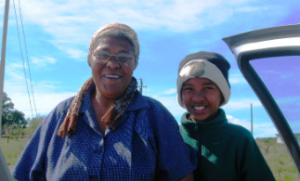 When they arrived at their destination, Andeline invited John to visit their home in the impoverished township where only black South Africans lived. Guide books and government publications had stern warnings against picking up hitchhikers and visiting townships, but John trusted his heart and accepted the invitation. This opportunity to cross a bridge and be a guest, the “other” in a completely unfamiliar culture was shocking and inspiring. John and Amore exchanged addresses before parting ways. They agreed to become pen pals and stayed in touch through the years. Today, Amore and John are Facebook friends. John’s life was forever changed. John has been back to South Africa twice to visit Amore’s family and sing in schools. On the same trip as their fated meeting, John made some unannounced stops and asked if he could sing with school students. 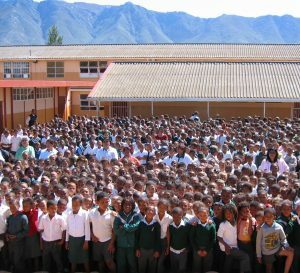 The DeRust Futura Primary School in Grabouw, SA welcomed the unexpected minstrel and a large, impromptu assembly was organized. They sang and laughed together cementing a friendship that has also endured. John has returned to DeRust and the students and teachers there have participated in several BoPH projects. The openness, warmth and curiosity of the children and teachers at schools like DeRust was uplifting and heartwarming but compared to the schools John was familiar with, the overcrowding and ill equipment of African schools was mind boggling. Nevertheless, the students sang, laughed and moved just like their vastly privileged peers John knew at home in the US. The striking contrasts were completely overshadowed by the profound similarities. John felt as though he had been let in on a some precious secret – we’re all really the same regardless of color, race, wealth, religion, gender, etc., etc. John’s new friendship with Amore, and these school visits in South Africa were the seeds that led to the formation of Bridges of Peace and Hope. After returning home to New York, John asked some friends, teachers, and musicians to come to the Farrell home for a potluck dinner in January 2006. He told the group he wanted to start an organization that would use music, art and storytelling to promote understanding and friendship among students from diverse cultures around the world. He asked the group if they would help. They said yes and that was the beginning of Bridges of Peace and Hope. The core group of BoPH advisors that assembled that night has changed over time but the contribution of every friend and supporter that shares our mission of promoting goodwill and understanding has been valuable and is deeply appreciated. For a few years, the informal organization of peacemakers consisted of a small but growing number of teachers and schools. 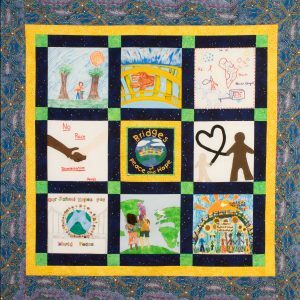 Several collaborative art, writing and music projects were completed including “These Are Our Hopes,” a three section quilt project with writing and art from hundreds of students in more than 10 countries. Sadly, the main quilt, pictured below, disappeared when John’s luggage was stolen at a train station during a visit to the International School of Brussels in Belgium. Thankfully, the other two panels were not in the luggage. In 2009, Bridges of Peace and Hope was incorporated and granted 501c3 non-profit status. Accepting donations as a recognized charity, BoPH has been building bridges of community, providing support to many service projects and groups in need. BoPH has organized fundraising concerts, clothing drives, and educational programs. 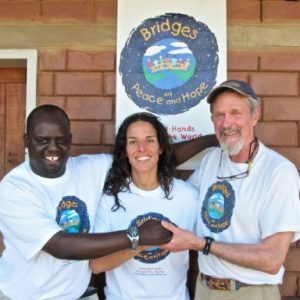 Bridges have been built to support the Hanahoe Children’s Clinic, collect and deliver clothing to victims of Hurricane Irene, and provide musical instruments to a school in Africa. 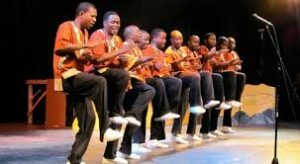 A bridge brought “Thula Sizwe,” an 11 man Zulu song and dance ensemble from South Africa to the US where BoPH helped raise over $80,000 for the members and their families. In 2009, on his third trip to Africa John Farrell was introduced to Ms. Laura Manni, the Volunteer Director of a then three year old school in Zambia. 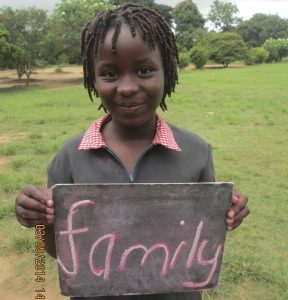 Laura brought John to her home, the Mukwashi Trust School in Lusaka West. Like everyone who visits MTS John fell in love with the wonderful children, staff and head teacher Mr. Judah Sikamikami. Soon BoPH schools in the US and Europe were collaborating with MTS in exciting ways including art, writing, music and video exchanges. Judah and the community respond with enthusiasm and passion whenever MTS was asked to participate in an educational project, professional development initiative, or cultural exchange. 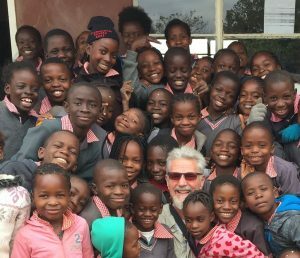 John has been to MTS four times and many other BoPH teachers have also visited the school to provide professional development and to learn about Zambian culture. BoPH made possible arrangements to have Judah and Mulemba, the MTS school leaders, attend and present at the prestigious European Council of International Schools Conference in Bulgaria in 2017. A team of teachers from the BoPH Club at the American International School of Vienna also attended and presented at the conference. On this trip Judah and Mulemba also visited AIS Vienna and worked with the teachers and students there. It was Judah’s first trip outside Africa, and his first time flying. He loved every minute of it! Led by Ms. Manni, MTS teachers continue to embrace new methods of teaching and they are inspiring their students to be self directed creative thinkers and problem solvers. MTS test scores are consistently in the top 10% in the country. MTS teachers are also sharing their new methods and strategies with other teachers in the region. Since 2009, friends of BoPH including schools, clubs, and individuals have donated over $95,000 to support Mukwashi School. These funds have been used to build new classrooms allowing the school to expand from K-6 to now serve Pre-K through Grade 11. BoPH has been instrumental in building the new high school wing and science lab. The Mukwashi vision for the future includes new sanitation facilities, a Community Resource and Teacher Training Center and more. The Girls Sanitation Facility will be completed in early 2019, and we have high hopes for the future phases of the project. 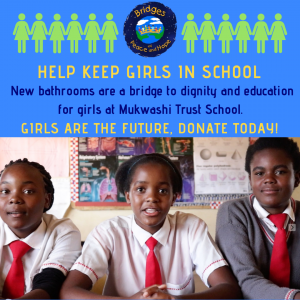 The Bridges of Peace and Hope Mukwashi Trust School success story is the model for the partnerships we hope to grow with many other schools and groups in the years ahead. By establishing meaningful friendships and creating community together we are making this world a little better. As we look to that future, the BoPH vision is to expand our network of participating students, teachers and BoPH clubs so we can continue promoting respect, understanding, collaboration, fostering friendships and partnerships that advance goodwill and peace across cultures and within our own communities. In Tonga, mukwashi means family.